For many of us sleeping bags are perhaps the last piece of camping equipment we think about. However, sleeping bags are extremely important as they can not only affect your comfort at night but also whether you’ll make it through the night! This guide will give you the information you require to buy the right sleeping bag which will make you night under canvas more comfortable. There are 3 main shapes of sleeping bags the mummy, the rectangular and the Lippi Selk shape. Regardless of shape, sleeping bags are designed to trap the heat from your body and some are shapes do this better than others. Originally every sleeping bag was rectangle until polar explorers found that they could increase the thermal efficiency and reduce cold spots by trimming the corners giving a snugger fit. This meant that there the entire fabric of the sleeping bag remained close to the body keeping it warm. Let’s take at look at the two shapes of sleeping bags and examine the pros and cons of each. This mummy shape sleeping bag has a tapered cut and, as the name suggest, has the shape of an Egyptian mummy. Its designed to be thermally efficient as it fits snugly around your body trapping your heat in an even pocket of air, preventing cold spots. The downside of a mummy style sleeping bag is that they do not allow you freedom to move you arms and legs at night when sleeping, which for some people may be a good thing! Mummy sleeping bags can have hoods, pull cords, inside pockets all of which are designed to get as snug a fit as possible. This reduces the amount of dead air in a sleeping bag which can reduce the inside temperature. The rectangle shape sleeping bags are, as the name suggests, rectangular in shape. They are bulkier and less thermally efficient than the mummy sleeping bags. However, they are very comfortable to sleep in and allow for a lot more movement at night and can also be unzipped and used as a blanket. 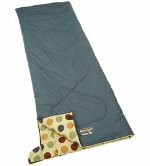 Rectangular sleeping bags may not be everyone’s cup of tea but they are perfect for caravans, hostels and sleep-overs. The main benefit is the freedom of movement and the ability to regulate the temperature easily by opening up the zip and they don’t cost a fortune to replace! The Lippi Selk sleeping bag is designed to try and make up for the short comings of the mummy sleeping bag by giving you more room to “thrash about” when your sleeping. No longer will you have to act like a giant worm at night when you move about your tent, with the Lippi Selk bag you just stand up and walk. We like the look and idea of the Lippi Selk but as yet we have not tried it out, although we can see the benefits. This may be the next big thing in sleeping bag design, long over due in that in all our years since we invented the wheel, we have only come up with two styles, see above. For more information and prices on Lippi Selk follow this link. Use this voucher code AOFF5 to get a further 5% off! The two types of sleeping bag fillings are feather down and synthetic fibre. Down is soft fine feathers found under the tougher exterior feathers. These feathers are very light and fluffy and act as a tremendous insulator – if they can keep baby penguins warm in the Arctic winter they’ll keep you warm! Down filled sleeping bags are more expensive than synthetic fibre filled ones but they are less bulky, warmer and lighter. It has always been a criticism of down filled sleeping bags that, when they are wet they are useless. Well I would like to see anyone spend a night in a wet synthetic fibre sleeping bag – they’re just as uncomfortable. Ensuring that your kit, especially your sleeping bag, is dry should be at the forefront of any camper or climbers mind. There are three types of down filling commonly used in sleeping bags, Duck down, Goose down and Hi-Loft down. Goose down – very fine feathers which are light and provide approximately 25% more insulation than duck down. Goose down is expensive and used in high end sleeping bags. Duck down – is a lot cheaper than goose down but is thermally less efficient than the equivalent weight of goose down. Hi-Loft down – is specially selected goose down which is extremely fine which means even more air is trapped resulting in better insulation than the usual goose down sleeping bag. These types of sleep bags are used in expeditions where bulk, insulation and weight are all important. When buying a down filled sleeping bag you’ll also notice that they come in various grades or percentages. Typically you’ll find down filled sleeping bags with 80% rating meaning that the filling is a 80% down and 20% normal feathers. Basically the higher the percentage of down feathers the more thermally efficient it is and more expensive. There are various types of synthetic fillings but we don’t really like synthetic fibre sleeping bags so we lost interest in finding out more about the materials. They do have their place but we think that spending a wee bit more money on a quality down filled sleep bag will be money well spent in the long run. Well you have decided on what shape of sleeping bag you want and what filling it has but how do you know if the sleeping bag will perform in the conditions you’re likely to expect when using it. An advisory European standard, EN 13537, was introduced to try and make it easier to compare sleeping bags – it does make things easier but you should not choose a sleeping bag based on these figures alone. Many of the top manufacturers will display the European standard results which fall into four rating categories, Upper Limit, Comfort, Comfort Lower Limit and Extreme. Upper Limit is the highest temperature at which an average male would expect a comfortable nights sleep without sweating too much. Comfort is based on an average woman have a comfortable nights sleep. As women sleep colder they need more insulation in their bag at night and consequently this rating is higher than comfort lower limit for men. Lower Limit is the lowest temperature at which a standard adult male is can have a comfortable nights sleep. Extreme rating is a survival only rating for a ‘standard’ adult woman. “In the risk range a strong sensation of cold has to be expected and there is a risk of health damage due to hypothermia.” This is an extreme survival rating only and it is not advisable for consumers to rely on this rating for general use. how efficient the sleeping mat is. These factors all play an important part in how well a sleeping bag will preform but we recommend that you should, if in doubt, go warmer. Going warmer means that you can always cool down by either taking off some clothes or opening the sleeping bag up. 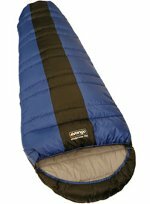 All manufacturers which we showcase provide lots of information about their product and even suggest what season the sleeping bag is designed for. With sleeping bags you get what you pay for, a good quality sleeping bag will be expensive but last and perform longer. This means the cost per usage will be very low! If, however you only intend using the sleeping bag for sleep-overs and hostelling then get a cheap one, they’re easier to replace. If you have any tips or advice on sleeping bags please feel free to post your comments below.